ONe day last week, I took Miss M. to work with me. She brought her harmonica, and played it in the office. But she calls it her "more hanukah". I love that. We're not even Jewish. But seriously, why do toddlers get syllables out of order like that? She does it with some other words as well - of course I can't think of any at the moment. Oh Joy, Oh Jury Duty! I got called to jury duty...starting today. Federal jury duty. In Manhattan. And, by 3:00, I was on a case. They say that it will only last a week or so. I've been called before, but only for the state, and never before did I get past the voir dire. But, I have to say, the feds treat you better, and their courthouse and courtrooms are way swankier than any state courts I ever saw. The building is relatively new, and rather dull architecturally, but has great views! It's a slim tower with not many peers, and the court room, the jury room, even the hallways, look out over Manhattan. To the north is a City park: Columbus Park. From the air, I could see footsteps in the snow, and someone had drawn Chinese characters in the snow in the park. And elsewhere, the snow had been colored pink - almost like with spraypaint, it was so diffuse. So curious. The voir dire was entertaining - I wanted to play matchmaker: 3 musicians, a handful of nurses, some computer guys, a couple of school teachers. It's funny how such a weird mixed bag of people ends up with so many strands of communality. 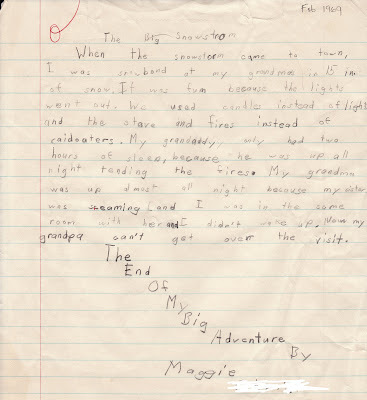 Since they are predicting snow for tonight, it seemed appropriate to post this little thing - an essay I wrote in 1969 when I was in the third grade. My mother had to have her gall bladder out, and we children were sent off to stay at my grandparent's house for a couple of days. We got stuck there when a huge snowstorm hit, and my mother ended up staying in the hospital an extra day because my father couldn't drive over there to pick her up. The so-called "Lindsay storm" pounded the northeast. Bedford, Massachusetts recorded 25 inches of snow, New York City had 20 inches, and Portland, Maine ended up with 22 inches. The storm got its name from New York Mayor John Lindsay who ran into political misfortune after sections of New York city remained unplowed for a week after the storm. We had friends over for dinner last night. The main course was a one-pot wonder dish: leg of lamb roasted OVER a gratin of potato, onion and tomato - the lamb juices drip down onto the gratin. [The recipe is from Patricia Wells' Bistro Cooking.] The trick is to figure out how to suspend the lamb over the gratin...luckily we have a roasting pan with a rack that can be tricked into hanging off the edges in just the right way. The little knob in the photo is the very end of the leg; it was too long to fit on the rack AND the butcher had cut it part through there, so off it came to be roasted alongside - waste not, want not! 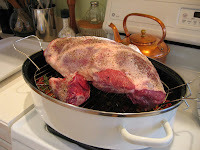 The lamb was local, from Hemlock Hill Farm. 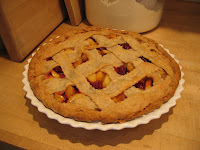 For dessert, I made an apple/cherry pie, using apples and sour cherries that were in the freezer. The crust was made with butter and lard (about 1/4 lard), and with a half and half mix of white flour and King Arthur white wheat flour. I like using that white wheat flour...I'm happy to be adding some whole grain into things, and if the ratio of white to white wheat stays better than 3:1, the white wheat is fairly imperceptible. Using it 1:1 in the pie crust meant a sturdy, nutty, crunchy crust - delicious! Miss M. was caught picking pieces of crust off the leftover pie this morning. Miss M. has been sick all week. Monday was a holiday, I stayed home with her on Tuesday, she went to Grandma's on Wednesday, and today I took her to the office. I thought she was better, but she spiked a fever again at about 11:30 - so home again we went. Anyway, on the train in, she said to me "Mama, you're so kind to me". And later, leaving the train platform and emerging into the splendid main area of Grand Central Terminal, she said "it's so beautiful". Indeed it is and indeed I am. The best part, if you ask me, is that you can even make it with those cherry or large grape tomatoes that stay eerily fantastic — I try not to question it — through the winter. I understand that completely - I'll buy those eerily fantastic grape tomatoes in the winter time to toss happily into a salad (well, until my conscience gets to me and I decide that buying Florida tomatoes in January is a waste of fossil fuel). So, last weekend, we found some of the now-allowed-to-leave-Florida UglyRipe tomatoes in our local A&P - so we bought one, out of curiousity. It looked good. It had a nice texture. It had zero taste. No flavor. Oh, and it was $4.99/pound, so one tomato set me back $2.84. I think perhaps the USDA ruling was unnecessary. Oh well. Back to the eerie grape tomatoes. Oh joy. Here's what's happening at my house today. I'm at work so I don't get to see it. And Miss M. is at Grandma's, so she doesn't get to see it either. Tant pis. Oh, there's a big hole in the street. Not certain yet if it's our line, but certainly looks like it. Water running copiously from the roadside wall of the pit that exposed our curb valve. The curb valve is not the leaking culprit - somewhere between it and the water main. Line into the house from curb valve looks ok, and is the same material as protrudes from the foundation wall in the basement. This is good because indicates no splices or shenanigans performed upon it. They will snake this line to check it. Line from the curb valve to the house is greater than 48" below grade. Modern code for this climate is 42". This is good. Five men, excavator, jack hammer, compressor, blacktop machine, road flagman, five trucks. Big crew, hence the price seems relatively fair to me. And barring disasters, they will get it done today. Okay, okay, the kid is now three years old, but I never did write this down, so here goes. Besides, I have a couple of other posts brewing, for which this will be background. At the 20 week ultrasound, we learned that I had a complete placenta previa. But, by the follow-up ultrasound at 28 weeks, the placenta had moved out of the way. It was still low lying, but out of the way. About two and a half weeks before my due date, I woke up at about 4am to go to the bathroom and discovered a gush of blood. I thought my water had broken. I called the doctor, and they sent me to Labor & Delivery. L&D checked me out, said it was probably the edge of the placenta lifting up as the cervix worked towards readiness, and sent me home a couple of hours later after confirming that the bleeding had stopped. Two days later it happened again. This time, I was seen in L&D by one of the four OBs in my practice. He said I had to stay – one bleed was okay, but two wasn’t. After discussion, we decided that an induction was appropriate. So I spent all day Sunday hanging out in L&D waiting until a midnight dose of misoprostol – hospital policy says that inductions start at midnight - I guess to try and make the deliveries happen during office hours? The misoprostol got labor started by about 5am and things were cooking by the time OB#2 arrived – I was 4cm dilated around 8am. She thought, we thought, everyone thought she was going to deliver this baby. But no. Labor stalled. They added pitocin. I had an epidural. They broke my water. Nothing. OB#3 arrived around 3pm, and I’d only gotten to 5cm by 4pm, with increasing amounts of pitocin. No dice. OB#3 convinced us that a c-section was appropriate so off we went to the operating room around 5pm. The section was not nice. To start with, there was a tiny spot along the incision where the nerves weren’t blocked. OUCH. From there on, it’s kind of a blur. I remember W. looking over the drape and taking a picture of the baby coming out (8 pounds 4 ounces at 5:36pm). I remember him coming back after she was cleaned up and sitting by my head with baby M. in his arms, and I remember stroking her cheek. I remember saying to the anesthesiologist “I don’t feel good,” and “I think I’m going to pass out.” I remember seeing someone hang a bag of blood for a transfusion. And then I remember waking up in recovery and seeing OB#4. It turned out that after the baby and the placenta were out, the uterus failed to contract properly and I lost about two liters of blood. They gave me two units of blood. OB#3, who’d started the section, thought she might have to do an emergency hysterectomy, and so called in OB#4 for back-up. As it happened, they got the bleeding stopped and didn’t do a hysterectomy, but I was in the OR for about two hours, and in recovery for about 16 hours. The baby was in the nursery that whole time. I didn’t get to hold my baby until about 22 hours after she was born, when I was finally settled in my room. Yesterday, Miss M. and Granny and I went to my niece's fifth birthday party. 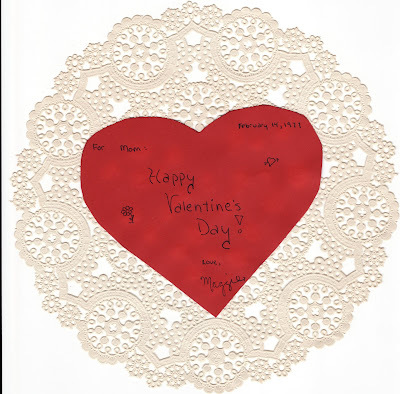 The party favors were little bags of homemade heart-shaped cookies, iced and sprinkled in pink and white and red. On Wednesday, Valentine's Day, it snowed here for the first time all winter. "Snow" isn't quite the right word; little pieces of ice fell out of the sky all day long. It didn't stick to the trees, it bounced right off the roof, and it landed on the ground in a 3-5" layer of crust. When shoveled, it came up in pieces - we talked about using it to build an igloo - but instead of building an igloo, we went to the supermarket. There, they were selling daffodils for $4 for a bunch of 20. I almost never buy flowers - it seems too ephemeral a luxury for me, even though they last longer than a nice bottle of wine or a good piece of cheese. But at $4 for 20, even I couldn't resist. 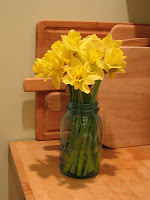 Someday it will be spring, and the daffodils will bloom in the garden. Until then, these will have to do. 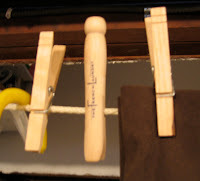 Okay, it's a terrible photo, but that's my French Laundry clothespin, the oh-so-charming clothespin that's clipped to the napkins when you arrive at your table. Mine's now resident on my cellar clothesline. We'd spent the day touring Sonoma and Napa, with Alisha, a friend of my brother & sister-in-law, in tow. She'd been invited along for an outing, with no idea that the end of the day would be spent eating for hours at the French Laundry. The dinner was to be a surprise for her - a thank you for her having made the wedding cake. After awhile, we ran out of things to do, and it started getting dark, and so they told her what we were going to be doing. She shrieked. My brother decreed that "we need a dive bar" - since we had time to kill, and had to change for dinner. Not expecting to find any such thing, we drove around and found Pancho's - a smoke-filled dive bar in Yountville, complete with two pool tables. We went in and got drinks, then one by one changed in the spacious spotless loo. After we were all changed, a guy who'd been playing pool came over and said "so, you're having dinner at the Laundry?" We said "yup" and he said he'd been twice. We proceeded to the French Laundry. Our waiter, Milton, came over and somehow it came up that we'd been at Pancho's - his face lit up and he said "that's where we go after service!" The meal was spectacular and fun, not stuffy or pretentious. Just superb food and gracious service. Milton was a great waiter - full of knowledge about the food, the wine, the kitchen - and completely amenable to a couple of small changes to the menu. We all ordered the "meat" tasting menu (as opposed to the vegetable one) - but I asked for the lobster to be replaced with anything, and Alisha really wanted the mushroom dish on the vegetable menu, so Milton engineered some swaps. The table next to us had their champagne decanted...something I have never before seen. We asked Milton about it - he said they'd asked for it and that occasionally a very aggressively bubbly champagne warranted it. Go figure. Milton offered us a tour of the kitchen which we jumped on - they were pretty much done with the dinner service, with only cheese and dessert courses left for a few tables, but it was great to see anyway, and looked just like I'd imagined from reading about it in Ruhlman's book. Sometime in the middle of dinner, Milton told us about a table of four from New Jersey who arrived and said they didn't want anything on the menu - apparantly they didn't know what they were getting into - but the restaurant solved the problem by bringing food in from their sister bistro Bouchon - how to explain the desire of the restaurant to please its customers in any way and dis New Jersey at the same time, huh? I would do it again sometime, but first, I'm having dinner at Per Se - next month. Why? Because when I told W. that I was flying across the country for dinner at the French Laundry and leaving him home with Miss M., he told me that the condition was that I take him to Per Se. So, with the help of his other sister, we wangled a reservation there. What the hell. You only live once! Coincidently, Fesser had a post yesterday about Italian Laundry - a thing of great beauty. I went away for a long weekend last weekend - to San Francisco to visit my brother and his new wife, and to eat and drink and sleep with abandon. It was heaven. Friday, my brother picked me up at the airport and we had lunch at the Liberty Cafe. I had the beet/goat cheese strudel, followed by their banana cream pie. And a glass of wine. After tooling around, stopping in bookstores and eccentric other spots, we picked up his wife and had a lovely Gruner Veltliner at the Hotel Biron. Dinner was at Blue Plate, where I had pan roasted chicken livers followed by gnocchi. For breakfast on Saturday, we scampered to Tartine for scones and croissants and bread pudding and yogurt and freshly squeezed grapefruit juice and lots of coffe. My other sister-in-law (that is, W's sister) picked me up for a few hours - we drove around in the rain, checked out a plant sale at the botanical garden, and ate an udon lunch. She returned me to my brother's care, and after a tour of the not quite finished Federal Building, we did the tourist thing and had drinks at the top of the Marriott for the view. We had a feast at a friend's house that night - fried chicken AND mashed potatoes AND collards AND brussels sprouts AND salad AND biscuits AND cornsticks. Sunday we had breakfast at Atlas and then got in the car, picked up a friend of theirs and set off over the Golden Gate bridge. Our first stop was a wine tasting at Bella, in the Dry Creek Valley. Their wine was nice, their caves were great, their picinic tables were splendid. A bottle of their zinfandel washed our cheese and crackers and apples down perfectly. We then headed towards Napa, for a little shopping in St. Helena and more wine at Alpha Omega. Their 2005 Sauvignon Blanc was lovely, but the 2006 - feh: cat piss. Sunday dinner was the raison d’être for the entire trip: dinner at the French Laundry. And yes, it was fabulous. And yes, it was worth flying across the country for. 1971. 2007. It's still Valentine's Day. Mmm. In a fit of something or another last night, I made dinner straight out of yesterday's New York Times - polenta with fried egg on top and sauted greens alongside. And it was delicious. And the red wine alongside - splendid! To gild the lily, the leftover polenta, warmed up in the microwave, made a lovely breakfast. As for wines, they are for me. I like honest wines as such, all of them and always. Of course some are better than others, and I like the best ones the most. But I could and would forgo any other liquid forever, as long as I might drink one humble wine with my daily bread. I like wine before, during, after, and in between meals, if things point that way. I like to know, and to use, local wines, which is probably why I have managed to live near the grapevines since I was four. If I were told today that even one more sip of wine would kill me, I might believe it, but I know that I would also investigate the prognosis, weigh its validity, and then decide for myself. If I agreed to abstain for survival's dubious benefits, I could at least taste vicariously by continuing to serve wine to my friends and, like old George Saintsbury in his Cellar Book, grow mellow on memory. Sunday brought another wonderful obit from Douglas Martin of the New York Times - that of Elizabeth Tashjian. Her father was a prosperous rug trader, and her mother came from an aristocratic family with a castle. Ms. Tashjian had a museum of nuts, in Connecticut. The 48 word first paragraph contains the word "nut" five times. According to the obit, she had a late life career as a guest on TV and radio. For those appearances "she often took along her huge, disturbingly suggestive Coco de mer nut" which weighs 35 pounds and "resembles buttocks". I could keep quoting, but maybe you should just go read it and raise a cocktail peanut to Ms. Tashjian. Parent Hacks got going on the Annie's vs. Kraft debate too. There were some good points, and some good alternate recipes. Better and you don't have to drain the noodles is the Consumer Reports recipe. Measure 2 cups water and 1 cup noodles into a pan, add a dash of salt. Bring to a boil on high and then continue on high for 4 minutes, stirring frequently. Turn down to medium low and simmer for 7 minutes or until most of the water has boiled away. Add 2 tablespoons butter, 1 cup cheddar cheese, paprika if you want it orange, salt and pepper to taste. You can also add a tablespoon of cream or milk if the sauce isn't saucy enough. I'm American (ergo, so are my kids), but mac-n-cheese is unknown in France. Turns out they don't really like cheese on their pasta anyway. And they didn't like boxed mac-n-cheese during a visit to the States. This might be a novel idea...but, boil some pasta, add a little butter or olive oil and/or salt, pepper (and grated cheese if you want), and see how your kids like it. Seems logical to me...why do our kids need the extra "cheese," especially when they are little? And then if you make real macaroni and cheese, it's that much more special. Lots of times, Miss M. asks for "plain pasta" - which in our book is pasta tossed with butter and grated parmesan. Yum. And simple. Over on Megnut last week, there was a post that got me going. She was talking about an article on Salon that compares Annie's Macaroni and Cheese to Kraft's. The Salon piece kind of dissed both Kraft and Annie's (though the author confessed to keeping Annie's in the pantry), while Megnut felt that the Salon author was being overly harsh on harried parents trying to do the best for their kids, and thereby came squarely down on Annie's as better than Kraft's. Sure it is - no unpronounceable ingredients for one thing. But that completely misses the point - that Annie's stuff TASTES TERRIBLE. I bought some one day, thinking it wasn't such a horrible thing to feed my toddler, but it's gross. Besides, a proper macaroni and cheese needs to be baked. Don't want to mess with a white sauce? Try this recipe from the New York Times that uses raw pasta and a lot of milk - sure, it takes longer, but it tastes way better than anything from a box. Don't have enough time for that? If you have time to boil water for pasta, you have time to defrost some homemade red sauce and a couple of homemade meatballs. Eat real food, people. Like Michael Pollan said the other day - eat food your great grandmother would recognize. In a blender, purée cottage cheese, milk, mustard, cayenne, nutmeg and salt and pepper together. Reserve 1/4 cup grated cheese for topping. In a large bowl, combine remaining grated cheese, milk mixture and uncooked pasta. Pour into prepared pan, cover tightly with foil and bake 30 minutes. Not only did we not have a Diaper Genie (or one of its kin), but the only thing we ever used for the disposal of dirty diapers were the nice plastic bags that your groceries come home from the supermarket in. After all, they're free, and recycling them for diaper duty (ha ha, a pun!) gets a second use out of them. So what on earth does anyone need a product like this for? Mir on Wantnot would label this "Retail Gone Wrong".